Clear skies and a fresh Mistral welcomed the second day of racing at the Maxi Yacht Rolex Cup. After yesterday's coastal race for the entire fleet, the Race Committee today set eight mile windward-leeward courses for the Mini Maxi Racing, Wally and J-Class yachts while the remainder of the fleet sailed two slightly different coastal courses, a longer at 29 miles, shortened to 24 miles for the Mini Maxi Racing/Cruising boats. These latter courses visited many of the famous 'natural buoys' of the Costa Smeralda race course - Monaci Island, the Secca Tre Monti rock, the strait off Capo Ferro and the island of Mortoriotto to the south. In the fiercely competitive Mini Maxi fleet, battling for its World Championship, Andres Soriano's Alegre remains in the top spot as do Firefly (Supermaxi), Highland Fling (Maxi) and Lupa of London (Mini Maxi Racing/Cruising) in their respective classes. Among the Js the 40m Rainbow has moved into first place while Y3K has taken command of the nine-boat Wally fleet. Thanks to scoring a 2-1 today Roberto Tommasini's Judel Vrolijk 72 Robertissima has climbed from fourth place to second overall 4.5 points behind Alegre, on which John Kostecki is calling tactics, with Niklas Zennstrom's Rán 5 third. But his tactician, Vasco Vascotto had mixed feelings about the day's performance: "It was a great day even if we weren't too pleased with the first race. We didn't sail brilliantly, we can do better than that. Everything went right for us in the second race though, we were a bit worried about the wind shift on the final upwind leg, but we were able to control the boat well and get the result. We are happy today but we know that this week will be a real battle. Racing for the J Class remains extremely close. In each three races staged so far there has been a different winner and only one point separates the top three boats. Yesterday Rainbow was denied what would have been her first race win since scoring two bullets here last year, by a mere five seconds on corrected time, but this afternoon in a modest, shifting northwesterly breeze there was no mistaking the decisive Race 3 victory for the red shirted team. Finishing more than two minutes ahead of second placed Lionheart, Rainbow earned the overall lead with a 2,3,1 scoreline which puts them one point ahead of Lionheart and Ranger. Although Ranger, winner of yesterday’s coastal race, led early in the first race of the day it was Lionheart which used the breeze slightly better on the first downwind to close right up to the leaders by the leeward gate. When they went right up the second beat Lionheart was able to just cross Ranger on the approach to the windward mark. In the shifting breeze both leaders had to tack twice on the final approach and that allowed Lionheart a margin which they were able to increase significantly down the run to the finish, winning by more than two minutes. Ranger took second, Rainbow third and Velsheda fourth. The second race was contested in a slightly lighter breeze. Velsheda nailed the pin end of the start line to perfection and continued left, as Lionheart and Ranger headed right. But the best wind pressure was up the middle of the course really, and that was the winning factor recognised by De Angelis and Ivaldi. Rainbow was already over 100 metres down the first run when the second and third boats were just approaching the windward mark. And even when their light kite exploded and they had to sail bare headed for a short time their margin was only eroded slightly. 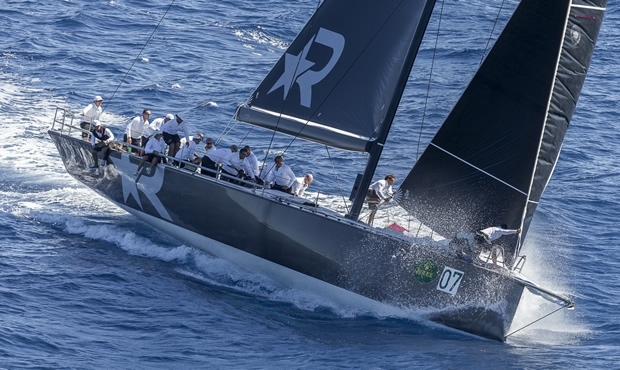 Rainbow’s third and first for the day give them the regatta lead for the first time this season, but the omnipresent Lionheart – winners in Menorca and Palma – are obviously on the prowl returning a first and second today. Neelemann concluded: “We had to improve our starts. The first race start was really terrible and so that helped us win for sure, we had lot of speed and clear air off the line. After that we could cover the two other Js and we just really had good speed. At the end of the first beat we were well ahead. It was just down to speed. If you lose speed in these conditions it is really hard to get it back. That was the thing. I saw Lionheart pinching high a lot in these conditions. “When we hoisted the kite there was knot in the middle. We thought OK we would be fine until the gybe and would switch it. But just before we went to gybe it broke and that was that. The results in the Supermaxi division were an exact replica of yesterday's and leave Firefly topping the leaderboard ahead of the Swiss yacht Inoui and Italy's Viriella with Mauro Pelaschier at the helm. In the Wally class, Claus Peter Offen's Y3K took a second place and a bullet in the windward-leewards to move up to first place overall ahead of J One while the Wally Cento Magic Carpet 3 slipped back to third place after coming fifth in the second race of the day. The Mini Maxi Racing/Cruising division saw Jeremy Pilkington's Lupa of London dominate for the second consecutive day, taking victory in real and corrected time. Russia's Bronenosec in took second place in today's coastal race and climbed to second place overall ahead of French yacht Arobas. There's no change in the Maxi division as Sir Irvine Laidlaw's 25m Highland Fling claimed another bullet ahead of the Swan 90 Odin.